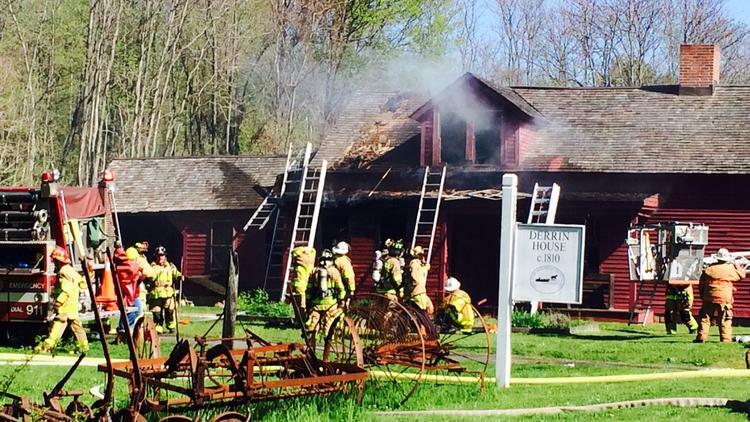 As many of you know the c.1810 Derrin Farmhouse at 249 West Avon Road, part of the Avon Historical Society, suffered severe fire damage this past Wednesday, May 11th. Thanks to the very quick and precise response by the Avon Volunteer Fire Department, with mutual aid from Simsbury, Canton and Farmington, the structure was saved and it is structurally sound. The cause was deemed to be an accident – spontaneous combustion of oily stain soaked rags left in a plastic garbage pail from some volunteer work done the day before the fire. We have set up a funding site for donations and I am asking you to consider a donation and to share this site with your contacts who might be interested in donating. And if you are on Facebook, we would very much appreciate it if posted the site on your Facebook page letting others know of the opportunity to save this over 200 year old structure. The site is: www.gofundme.com/derrin. 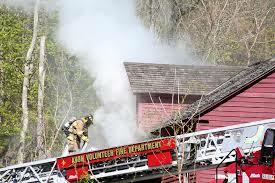 Or donations can be made to: Avon Historical Society, P.O. Box 448, Avon, CT 06001. Note on the memo line: Derrin House. All contributions are tax deductible. The past 72 hours since the fire has been a learning process for all of us. But we have received an overwhelming amount of support from local and state organizations (even the New England Museum Association) all standing ready to help us as we go forward. Some even arrived on scene yesterday afternoon to tour the damage and provide advice and consultation on next steps. Those who have been through this before say that lemonade can come from lemons; we are hoping this to be the case. And we are quickly learning that this is going to be a very long process, so we are moving carefully and deliberately to make sure we achieve our goal. As part of background, the Society does not own the building. It is leased from the CT Department of the Military because the last family to live in it (not Derrins) were the caretakers of the First Co. Governor’s Horse Guards which is located across the street. We have had the lease since 1996 and there has been a large team of volunteers who have worked tirelessly over the past 20 years restoring the house with grants, private donations and lots and lots of donated materials. The lease requires the Society to carry insurance, which we do. But, as you can image, no amount of insurance can replace what was lost. So we are seeking donations to help this process move forward. We will be updating the Society’s website tomorrow with more details, but the GoFundMe page has photos and explanation of what happened. We had planned a grand re-opening event on June 12th to mark the 250th anniversary of the Derrin Family signing a deed taking over the land that this house is on today. The work being done inside was getting ready for that day of celebration with the opening of a new Visitor Center. The Derrin family owned three houses and farms on West Avon Road from 1766 until the 1940’s. Many of you may know the “flower house” on the same road just south of our Derrin House. That house was also a Derrin Family house and farm. Thank you for considering a donation, which can be anonymous, on the funding site or via the mail. Or, if you do not donate, but can pass on this information to others, we would very much appreciate it.